Are you still wondering that how most of the famous blogs are using numbered pagination, instead of displaying older and new post buttons at the bottom of every Blogger archive page? 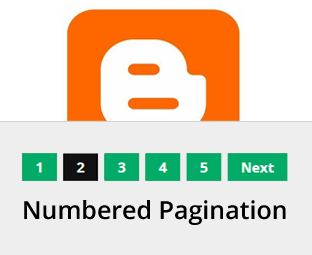 Recently, one of our users asked us, How to add Numeric Pagination in Your Blogger Blog? We have been using number pagination on MyBloggerLab for quite a while now, and from our experience it gives you 10 times better pageviews than the older and newer post button. It is more user friendly, attractive, and SEO friendly. Most of the advance Blogger templates like Templateism comes with builtin Numeric pagination. In this article, we will show you how to add numbered pagination in your blogger blog? Numbered pagination is a numeric navigation menu which is usually present at the bottom of the archive pages. It divides your whole blog into different pages, just like the pages of a book. Users can simply navigate through page 1, 2, 3, 4 and etc . We have attached a screenshot below, so that users can easily understand our words. How to Add Numbered Pagination in Blogger? The firest thing you need to do is to login into your Google account. Once logged in go to Blogger Dashboard >> Template >> Edit HTML and search for the Skin tag ]]></b:skin>. After finding the skin tag, just above it paste the following piece of coding. Congratulations: You have successfully added numbered pagination in blogger. Now go and check out the interactive preview to see the amazing navigation in action. With a little modification is CSS, anyone can customize to give it the desire touch that he needs. We hope this tutorial may have helped you in learning how to add numbered pagination in blogger. If anyone find any difficulty then don't be shy to make a comment below or tweet us @mybloggerlab. What error you are facing? where is the 'skin tag'? I am able to achieve it but numbers are coming in disoriented way. Can you please check http://phototravelings.blogspot.com/ and suggest? Hello, thank you. It is really help full. It works on me but I don't know how to remove defoult page navigator. Now there are both. Plus, it shows 7 pages but, the 7 page is blank. Sorry, you didn't understand me. I do not want that text to appear. Hi i tried your pagination but what i'm having issue now is that when i click on the next page, it does not shoe my previous blog posts accordingly.. It's all messed up... Why is it so? Thanks! I am trying to get this pagionation in my articles but I cant find any tips about that. This is all working I got the pagination in my website. Can someone help me and give me a tip how to do this in my articles? It works correctly, There might be some problem with you blog? What's the URL of your site. hey thanks for the great post. but whenever i click a post the pagination is gone. Yes because on posts you have "older and newer buttons" which takes you to new articles. If you will use pagination is posts than it will take you to archive page instead of the next post. Thanks it has worked for me. Any suggestions on modifying the page number styling to match it with the overall blog appearance. Thanks, I was able to make this work on my blog. But I see that some of my posts are not appearing on any of the pages. Can you suggest why would that be happening? 2 such posts are not appearing. The posts before and after these are appearing fine. can you help me? its not working for me? not sure what i did wrong! Can I see your blog URL? Hello Mod, You save me from this problem. It already took me a day and im lucky that i search this solution in your blog. And thanks to EDDY SUPRIADI for asking for a solution to that problem when viewing on labels pagination is not working. "The only difference is a & after the ? in the max result thing"
I am having troubles editing this into my blog. I followed all the steps listed above, but when I save and refresh the page I still see all the entries on the page and it still says "older post" at the bottom. After ONE year , i wd like to say, thax. Just wanted to mention that if anyone is having problems with their older pages not showing any posts, make sure the "pageCount" in the script matches the number of posts you've set your blog to show. I had this problem but after doing so, it worked fine! Also just wanted to say thanks for the widget! please tell me how to fix it? Hello brother i installed this widget in my blogger and it also work fine but the problem is that the CSS code is not working which is provided above. Please help me. The panination is displayed without any style which is provided above. I installed the css code carefully in template and also again and again check it but the css styles are not displaying. here is my blog adress to check as live. You need to Add CSS to add style to it. Please follow the tutorial. Successfully added the code but it only separated my 8 blog posts into two pages. Anyway I can code it to separate it post by post? Or will that come when I add new posts? I'm not having any luck! Also, my blog posts are set at 5 for each label and the homepage, any thoughts? Hello my friend! I follow the tutorial but I can´t see the pagination my url is monkeymotor.net Thank you!! Now works fine, code updated. Please provide me your Blog URL?